A Great Cottage on Lake Lansing - Great Views of The Lake - A Piece of Paradise! Vacation Lakefront 3BR 2 full bathrooms sleeps 5, Pet-Friendly. 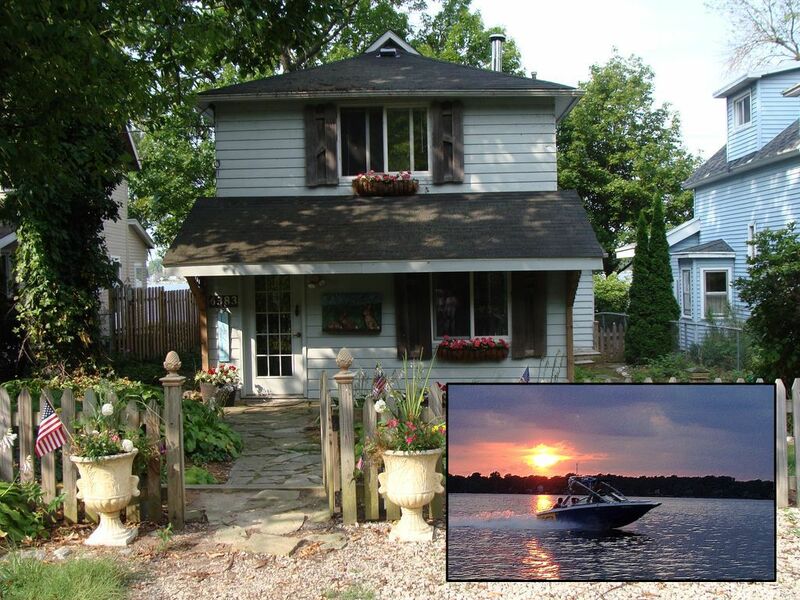 The charming, adorable cottage is directly on the lake. Your deck will allow you to have many hours of relaxation and sunset enjoyment. There are 3 bedrooms, which have 1 King and 3 Twin beds. There is an upstairs and a downstrairs bathroom. This home is fully firnished with all kitchenware, linens and towels. The yard is fenced in, which provides security for your little, pet friends. ~New kitchen appliances to prepare wonderful meals makes your stay very comfortable. ~A washer & dryer is provided. ~The bedrooms are roomy with king & twin beds. ~Bring your laptop computer and go on-line. ~A warm and comfortable living room with Lake views! ~Cable TV provides a place for entertaining. Water-skiing, tubing, swimming, boating, fireworks (4th of July), golf course near-by. ~Lake home 2 miles from upscale Meridian Mall for excellent shopping and dining. ~Theaters and additional dining only minutes away. ~Michigan State University only 5 miles away. A lovely little home, clean and well maintained. Owner was very helpful and informative, returned calls immediately. Beautiful waterfront location, gorgeous sunsets, great deck, dock, and hot tub. We had 5 for a girls' getaway and all were comfortable. Great walking around the lake or on the paths through Lake Lansing Park. We will use it again if the opportunity arises. Had an excellent dinner at Dusty's Cellar. Great stay, couldn't be better! We were 3 couples meeting up for a long week-end for the homecoming football game at MSU and this place couldn't have been better. The dining and living room flow into each other so we had plenty of space to sprawl out and still stay connected with each other, along with the wifi to stay connected with everyone else. The back deck facing the lake was a perfect place to hang out and watch the sunsets over the lake. Although it only sleeps 5, we brought an airbed and everyone had a place to sleep. We all agreed it was much better than cramming into hotel rooms and the rates were reasonable enough to make that possible. The cottage is decorated "shabby chic" and fits the location so perfectly...there were so many cute touches! Julia the owner responded immediately to any inquiry and it was a breeze to rent. We'd recommend this cottage to anyone looking for an alternative to hotel rooms for a MSU event. It was a short 15 minute drive and 2 excellent restaurants are nearby, The Watershed and The Blue Gill. Both had awesome food and a good selection of beer. We'll be sure to rent this cottage next time we're in the area!